Add half of the smoked fish to a food processor or blender with the mustard, crème fraîche, sugar, and lemon juice and blend until smooth. Transfer to a bowl. Break or chop the remaining fish into flakes and stir it into the blended mixture with the pepper and dill or chives. Taste and add more lemon juice, if necessary. Allow to rest in the fridge for an hour or two before serving. 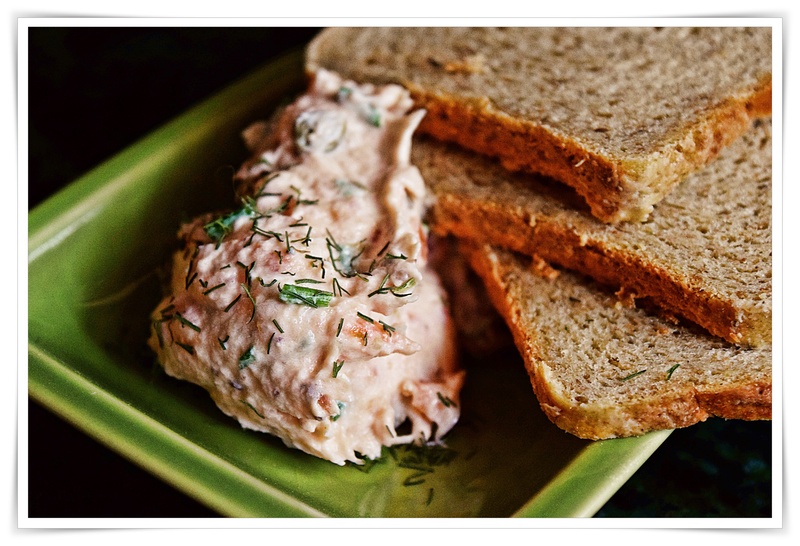 Serve the pâté with a dusting of paprika, if you like, and with buttered bread or toast. Fearnley-Whittingstall, Hugh (2011-04-19). River Cottage Every Day (Kindle Locations 2428-2432). Potter/TenSpeed/Harmony. Kindle Edition. What a great Easter and while my good friend and neighbor usually hosts a Saturday easter lunch and egg hunt we all bring something to the table and my contribution for dinner was a salmon platter with fresh veggies and a yogurt, sour cream, fresh dill and chives sauce to go with the salmon then another appetizer for our Easter dinner from Hugh Fearnley-Whittingstall everyday book, slightly adapted from his recipe calling for smoked trout which was nowhere to be found in the fish case this holiday weekend. 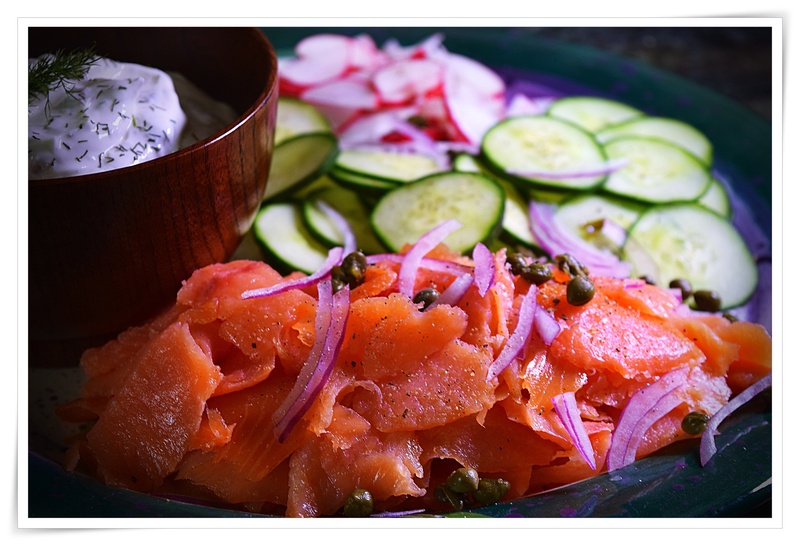 There were some little packages of salmon chunks just perfect for what I was doing, most just large enough for a slice on a piece of mini rye bread or on a slice of cucumber, but a good part of the package were slices that had to be cut in half. No real recipe for the sauce, equal parts sour cream and yogurt that equals about 1 and 1/2 cups, a tablespoon or to of drained and chopped capers, a tablespoon minced red onion, about a tablespoon fresh lemon juice, dashes of white or black pepper, a sprinkle of fresh or dried dill, taste and add more of whatever you like. 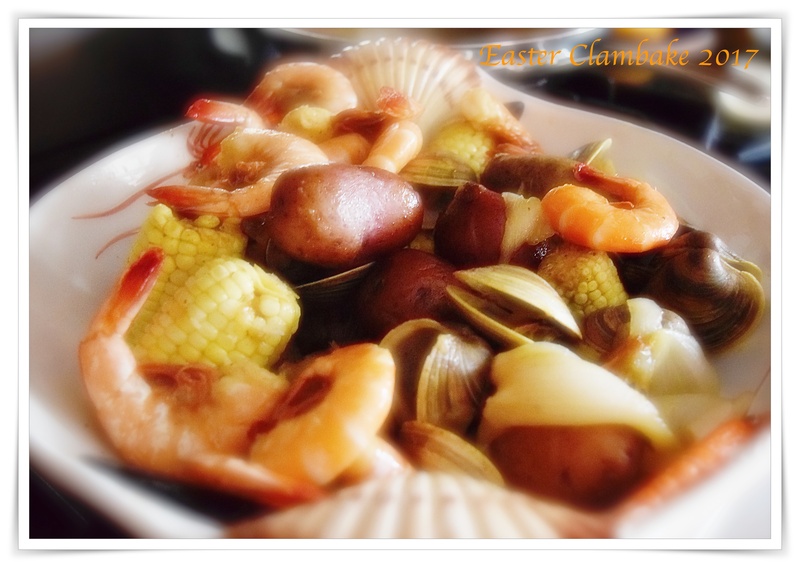 Since my neighbor hit all the tradition Easter food notes I didn’t have the least bit interest in a roast or a ham and all of the sides that go with so for our nontraditional Easter dinner on the back porch and a perfect way to kick-start our spring into summer menus I did a scaled back version of our normally huge clambake and it was so easy and not much of a mess to clean up having used one pot, 1 large bowl, two dinner bowls and a few utensils, a feast for us indeed. I added 1 bottle of beer and two heaping tablespoons of Phillips Seafood Seasoning to a pot and since it was actually my Cuisinart stainless flat-bottomed wok, I set a little steamer rack in the bottom just above the liquid level, tossed in a few (enough for two people) small potatoes, 1 large peeled and quartered Vidalia onion, 4 ears of corn broken in half, and about 1/2 pound of sausage links (thank you Cindy), cover and bring up to as boil, lower to medium and steam for about 15 minutes or until the potatoes are almost done. Toss in the clams and when they just start to pop open add the shrimp and a sprinkle of seafood seasoning and 2 tablespoons of butter, cover until clams are open and the shrimp is nice and pink and cooked through, about 3-4 minutes. Serve in a big bowl, with some melted butter, cocktail sauce and mustard for the sausage. An easy and delightful change on such a beautiful Easter Sunday!